Storyboard Pro brings your animation into the third dimension by letting you import 3D objects into your project. You can place, manipulate, and modify 3D objects and add new depth to your storytelling. 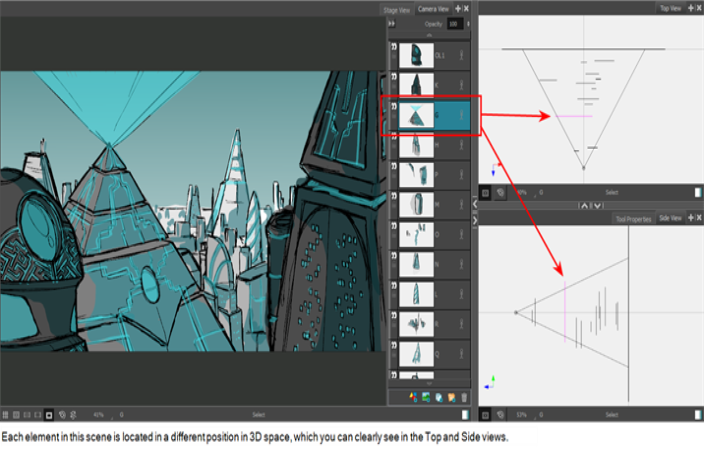 The Top and Side views are representations of your scene’s space viewed from the top and side. The views also display the viewing area that the camera can see. When you move an element along the Z-axis, notice that it seems the object becomes smaller or larger. This is because of the perspective effect. That is, the elements closer to the camera appear larger and elements that are farther away, appear smaller. Because of this, you may need to resize elements once they are positioned. Top View: Displays the EW and FB positions. Side View: Displays the NS and FB positions. Changing an element’s position affects all of its contents. Because these are 2D layers in your scene, they appear as lines in the Top and Side views (since you are viewing them from their sides). When you import 3D objects, you will see the full 3D object in the Top and Side views. ‣ In the Panel view, click the Add View button and select Side View or Top View. By default, newly created scenes are set to the 2D mode, so your project is not encumbered with unnecessary features if you plan to work in 2D for more than a few scenes. You can convert a scene to 3D, so you can move and rotate 2D and 3D layers in 3D space. This means that even if you do not have any 3D objects in your scene, you can still move 2D objects along the Z-axis to create a multiplane effect. A 3D scene will also allow a camera to be moved in 3D space using the Camera tool. NOTE: Converting a scene to 3D applies only to the selected scene, not the entire project. In the Thumbnails view, select the scene you want to convert to 3D. 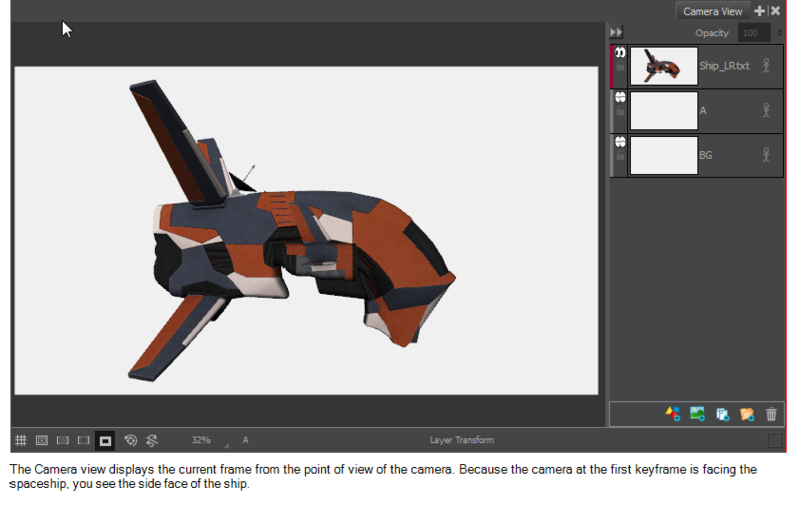 ‣ In the Storyboard toolbar, click the Enable 3D button. ‣ Select Storyboard > Enable 3D for Current Scene. • Imported 3D models are removed. • 3D camera moves are removed. • 2D layers that have been moved and rotated in 3D are be set back to 2D, removing those transformations. ‣ In the Storyboard toolbar, click the Reset Scene to 2D button. ‣ Select Storyboard > Reset Scene to 2D. When creating your project, you can import different types of 3D files. The supported 3D file formats are: *.osb, *.3ds, *.obj, *.fbx, *.dae (Collada) and *.abc (Alembic). When you import a 3D model, it is automatically added to the Library in the 3D Models folder according to its format. You can then reuse that 3D model easily within your project file. NOTE: It is recommended to use the .fbx format as it allows the textures to be packaged with the model. When you import a 3D model into your library, each time you place it in a scene, it continues to refer to the original model; that is, it does not make a copy of the 3D model. The 3D Models library is also local to your project, so you must import your 3D models in each project. In the Library view, right-click on the 3D Models library folder, and select Import Files. Locate your 3D file and click Open. The selected 3D file appears in the Library view in a folder labeled according to its format (for example, OsbModels for *.osb files). Select the subfolder that represents the format of the model you imported. All the 3D models that match that format appear in the Library tab. 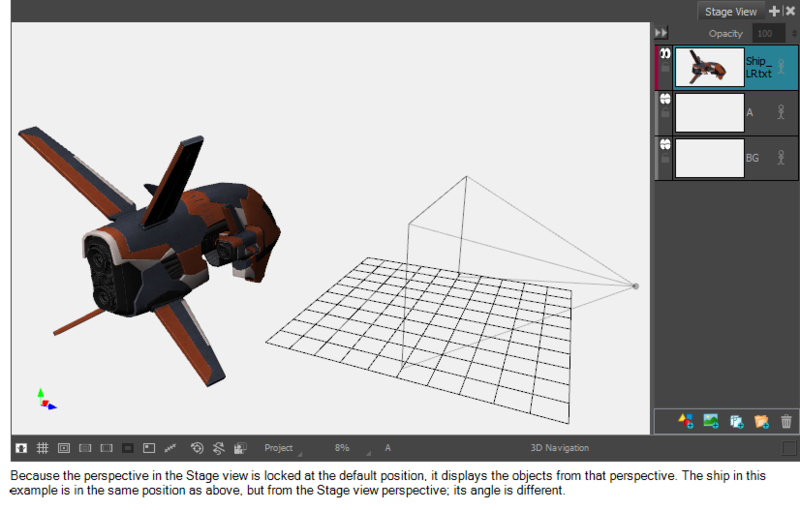 Drag the 3D model to the Stage view. The 3D model appears in its original size and is located at the zero NS/EW/FB position. The 3D model appears in all three view windows. NOTE: When deleting a 3D model from the 3D Models folder of the Library, every instance of the model used in the project will be deleted at once. A warning message will prompt you to confirm or cancel the action. From the Library view, drag one or more elements into your scene. By default, the elements appear in the NS/EW/FB offset position of zero in the 3D space. From the Tools toolbar, click the Layer Transform button. From the Stage view, select an element in your scene. A bounding box appears around the element and the layer appears highlighted in purple in the Top and Side views. ‣ Stage View: Changes the EW and NS positions. ‣ Top View: Changes the EW and FB positions. ‣ Side View: Changes the NS and FB positions. As you drag the element around in 3D space, the position of the element automatically changes in the other views. In the Stage view, the perspective is from a fixed point in space, as if were standing on the stage looking at the various elements. If you switch to the Camera view to preview the scene, the perspective is from the camera lens, so you can see exactly what the camera captures as it moves from one keyframe to another. Therefore, if you make changes to the camera position, especially if you change the camera’s focus, use the Camera view to preview the camera move accurately.